Keep it hot or keep it cold with needle-punched, insulated lining. 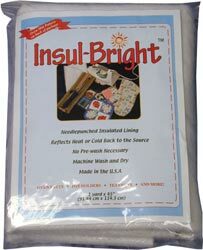 Use in hot pads, oven mitts, casserole warmers, lunch bags and picnic baskets. Perfect interlining for warm apparel- it reflects warmth back to the body and is breathable, letting moisture escape, and will not break down with washing. Keep out the cold winter chill and the hot summer heat- use in shades, draperies, draft stoppers, fire place covers and water heater covers.